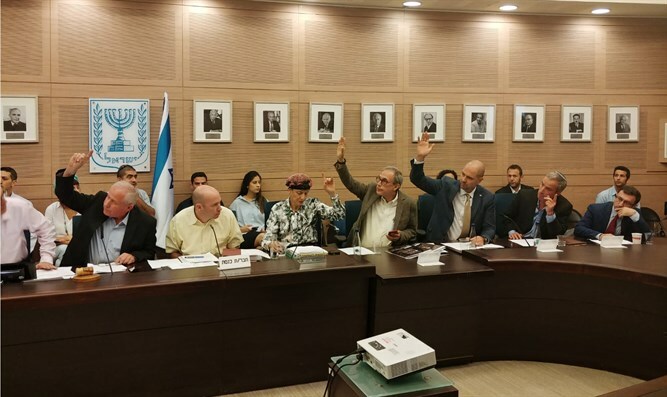 Committee approves in second and third readings law to withhold terrorist salaries from tax revenues Israel transfers to PA. The Knesset Foreign Affairs and Defense Committee approved in second and third readings the law to withhold terrorist salaries from tax revenues Israel transfers to the PA.
Only MK Robert Ilatov of Yisrael Beiteinu voted against the bill, which will be voted on in the Knesset plenum next Monday. The bill was approved by the committee without the clause requested by Prime Minister Netanyahu and Defense Minister Liberman, a clause that conditions the withholding on a decision of the political-security cabinet. Bereaved families attending the meeting asked to transfer the funds allocated to a special fund for terror victims, but the committee's legal advisor explained the move was legally improper. Law initiator MK Maj. Gen. (res.) Elazar Stern (Yesh Atid) said "the insistence on principles and persistence paid off. The law was approved according to the original wording we submitted. What's important to me is that no more families join the club of the bereaved and that the Palestinian Authority understand that supporting terror doesn't pay." Knesset Member Avi Dichter (Likud) said, "This is a moral law that sends a clear message to us, to the Palestinian Authority as well as to the entire world: Israel will not be a conduit for transferring money to terrorists." Im Tirtzu movement Policy Department head Alon Schwartzer, whose movement is accompanying the bereaved families, welcomed the bill's approval: "Approval of the bill in second and third readings despite the difficulties is an historic move. "The State of Israel must do its utmost to stop Arab terror and this law is another step forward in creating a complete deterrence package against terrorism. We'll continue to accompany the bereaved families who courageously and resolutely lead an uncompromising struggle against terror and for justice," he added. MK Robert Ilatov (Yisrael Beiteinu) explained his opposition to the law. "Committee members are celebrating and the bereaved families are crying outside the committee hall. The scandalous clause approved today, that I was the only one who opposed it, says that the money will not really be withheld from the Palestinian Authority, but will be kept on the side in a 'savings fund' with compound interest. "Instead of sending populist messages and making videos for Twitter, I'd expect MKs who approved this clause to look the Israeli public in the eye and explain why at the end of the process, which was accompanied by many congratulations and smiles, the terrorist's salaries will still reach the Palestinian Authority and eventually the terrorists."